Robin Strasser (born May 7, 1945) is an American actress, best known for her role as Dorian Lord on the ABC daytime soap opera One Life to Live. Strasser's birth name is Robin Victory in Europe Strasser, as she was born the day Germany surrendered in World War II. She was born in the New York City borough of the Bronx and raised in Manhattan by Martin and Anne Strasser. After graduating from the High School of Performing Arts, on full scholarship, she attended the Yale University School of Drama. She began acting in the early 1960s. Strasser sharpened her acting abilities in theatre, acting on Broadway, where she appeared in The Shadow Box and Chapter Two. Early in her stage career she met her first husband, Laurence Luckinbill; they were married in 1965 and divorced in 1976. They have two sons, Nicholas (born 1971) and Ben (born 1975). Strasser was also married to Richard Hogan from August 27, 1983, until 1985. She is a founding member of the American Conservatory Theatre, and began her extensive daytime career in 1964. Her first role was as Iris on The Secret Storm. In 1967, she originated the role of Rachel Davis Matthews on NBC's Another World. After leaving the role of Rachel, Strasser played Dr. Christina Karras Martin on All My Children. She was offered the role of Cathy Craig on One Life to Live, but ended up joining the show as Dorian Lord in 1979, when Claire Malis left the role. Dorian became a role for which Strasser became well known. Strasser had two stints as Dorian, leaving the show in 1987 and returning to play Dorian again from 1993 to 2000, 2003 to August 25, 2011, and then again in the online revival of the series in 2013. From 2001 to 2002, she appeared as 300-year-old witch Hecuba on the NBC serial Passions. Strasser won a Daytime Emmy Award for Outstanding Actress in a Daytime Drama Series in 1982 for her portrayal of Dorian, and was also nominated for the award in 1981, 1983, and 1985. Strasser has been nominated for Soap Opera Digest Awards for Dorian in various categories in 1986, 1988, 1994, 1995 and 2005, winning in 1996 ("Outstanding Lead Actress" for Dorian) and 2001 ("Outstanding Female Scene Stealer" for Hecuba). Strasser was an Honorary Chair of the Imperial Court of New York's Annual Charity Coronation Ball, "Night of A Thousand Gowns," on March 21, 2009. She was previously made a Dame of the Imperial Court of New York in March 2007, and attended the 2008 "Night of A Thousand Gowns." 1972 The ABC Afternoon Playbreak Shelley Carr Episode: "This Child Is Mine"
1973 The Delphi Bureau Jane Episode: "The Face That Never Was Project"
1974 The Wide World of Mystery Gina Episode: "Murder Impossible"
1974 The Rookies Laura Page Episode: "Legacy of Death"
1974 Paul Sand in Friends and Lovers Ellen Episode: "The Groupie"
1988 Highway to Heaven Kathleen Reynolds Episode: "Time in a Bottle"
1988 Annie McGuire Terry Episode: "Annie and the Brooklyn Bridge"
1988 Murder, She Wrote Sylvia Gagliano Episode: "The Last Flight of the Dixie Damsel"
1989 China Beach Dr. Joan Friedman Episode: "Women in White"
1989 Murphy Brown Vladia Episode: "Moscow on the Potomac"
1990 The Young Riders Grace Rollins Episode: "Fall from Grace"
1990 Dear John Brooke Collins Episode: "Matter of Trust: Part 1"
1992 2000 Malibu Road Episode: "Pilot"
1992 Civil Wars Episode: "Devil's Advocate"
1993 Jack's Place Lucinda Tremayne Episode: "An Affair to Vaguely Remember"
1996 ABC Afterschool Special Julia Episode: "Me and My Hormones"
2000 Grosse Pointe Lila Van Guilden Episode: "Mommy Dearest"
^ a b c d e f g "SOAP STAR STATS: Robin Strasser (Dorian, OLTL)". SoapOperaDigest.com. Archived from the original on December 21, 2010. Retrieved December 14, 2013. 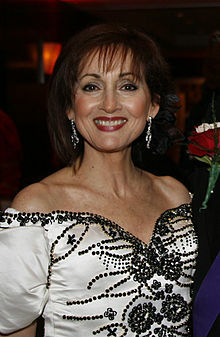 ^ "Robin Strasser Biography". Buddytv.com. Retrieved October 6, 2013. ^ Flynn, Lauren (2008). "One Life to Live Timelines: Golden Girls". SoapOperaDigest.com. Archived from the original on June 11, 2010. Retrieved December 18, 2009. ^ "Daytime Emmy Winners & Nominees: 1982". SoapOperaDigest.com. Archived from the original on January 13, 2010. Retrieved December 17, 2009. ^ "Daytime Emmy Winners & Nominees: 1981". SoapOperaDigest.com. Archived from the original on May 30, 2006. Retrieved December 17, 2009. ^ "Daytime Emmy Winners & Nominees: 1983". SoapOperaDigest.com. Archived from the original on May 27, 2006. Retrieved December 17, 2009. ^ "Daytime Emmy Winners & Nominees: 1985". SoapOperaDigest.com. Archived from the original on May 27, 2006. Retrieved December 17, 2009. ^ "23rd Annual Night of A Thousand Gowns". The Imperial Court of New York. Archived from the original on July 24, 2011. Retrieved March 1, 2009.